Scottish artist Lara Scouller finds her greatest inspiration for her animal drawings and paintings not in the wild, or even at the zoo, but among the taxidermy collections in European museums. She has exhibited widely across the UK and in Europe and has work in public and private collections. 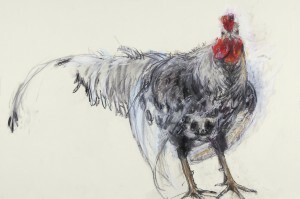 This two-day workshop is a unique opportunity to gain insight into how artist Lara Scouller approaches her lively ‘still life’ drawings of birds and animals. Working from her collection of bird specimens Lara will guide you through the different drawing stages, which will enable you to create your own pastel menagerie. During the two-day workshop she will introduce her work with a slideshow and discussion of her influences and inspirations including Degas, Manet and Joan Eardley and contemporary artists such as Paula Rego and Jim Dine. Insight into Lara’s drawing practice will include demonstrations of how she manipulates the pastels and provide an understanding of the way this medium lends itself to recreating colour, pattern and textures found on the surface of her subjects. Students will experiment with techniques such as blending, scumbling, feathering, dusting and using different line qualities. Layering techniques will be explored through the use of rags and putty rubbers and through working on top of existing marks helping to create a sense of movement and energy in the drawings. Following on from demonstrations of how the anatomy of the bird can be broken down into simplified shapes, students will embark on a series of drawings, working directly from bird specimens, exploring the bird’s structure and investigating alternative viewpoints and compositional possibilities. The weekend will end with a group critique providing the opportunity to reflect on the work and how students might apply what they have learned to their own working practice. Cost £80. There will be an opportunity to purchase specialist materials from the tutor, if required.